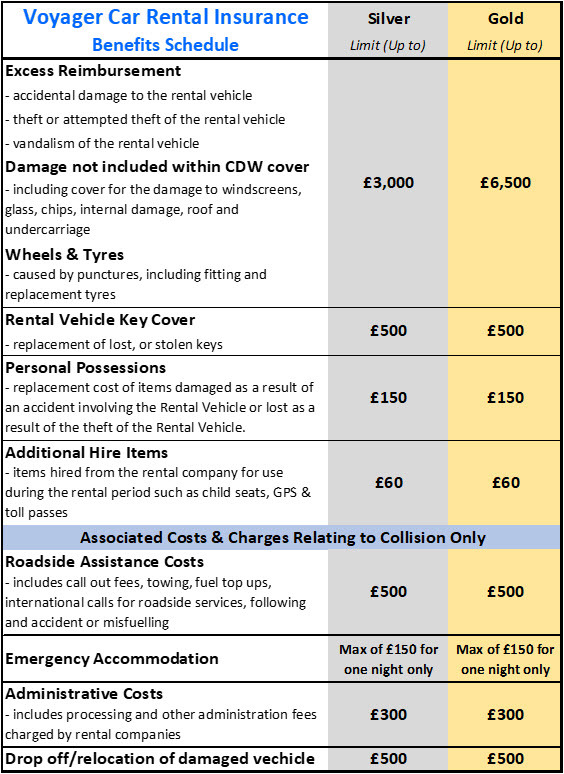 Did you know that when you rent a car, if it is damaged or stolen you could be left paying the bill? Many car hire rental agreements do give an option for a Collision Damage Waiver (CDW), or Excess Waiver, but usually you will still be liable for the excess the rental company has to pay to their car insurance company, even if it’s not your fault, which could be more than £2,000….. And often buying this cover from the car hire company can be very expensive! Sometimes you have the option for a Super Collision Damage Waiver (Super CDW) that may also remove the excess. We have teamed up with Voyager Insurance to offer a more extensive alternative to Super CDW – a car rental insurance to complement our Europesure products. We are now offering, to UK and Gibraltar residents, Voyager Car Rental Insurance. It not only covers the excess charged by car hire companies on a rental car agreement if your hire car is damaged or stolen, but also some cover not normally available under a car rental company policy. If you frequently rent cars at home, or abroad, then the annual multi-trip policy may be an even more affordable option saving you both time and money compared to buying single trip car hire insurance. The annual multi-trip cover car rental period options are either 31 or 60 days maximum duration per trip, unlimited trips in a policy year. Please be aware that some car hire and vehicle rental companies may try to scare you into purchasing their own policy by telling you this Car Hire Excess policy is not valid – THIS IS NOT TRUE! This is a sales tactic to try and get you to buy their policy. This policy is independent of your vehicle rental agreement. At date of issue the minimum age for this policy is 21 and the maximum age is 84.